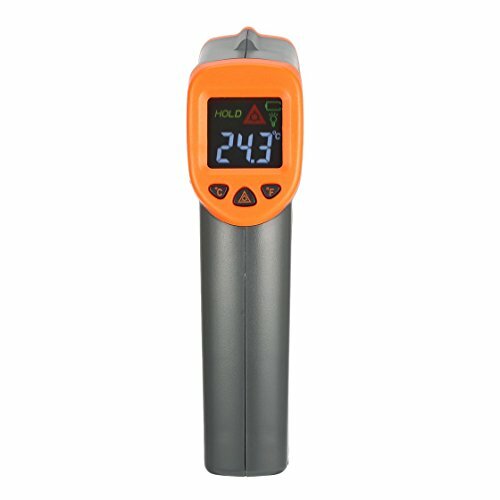 Smart Sensor AT380+ Digital Infrared Handheld Temperature Gun Thermometer with Non-Contact IR Laser Point Backlight -50~380℃ by Exiao at Mystic Oaks. MPN: Exiao. Hurry! Limited time offer. Offer valid only while supplies last. This is a thermometer with gun shape which is convenient to carry and use. High accuracy: Most organic products have an emissivity of 0.95, and with an advanced sensor, the surface can be measured with a resolution of 0.1 ℃ with high precision. Non-Contact: with laser positioning, it can test the temperature of the product without touching. Humanized settings: comes with LCD backlight, auto power off and battery indicator and ℃ / ℉ unit. Gun Structure: with a fine design, is comfortable to wear and use. Widely used: in industrial product, such as hot machine, electronic links and heat pipes. If you have any questions about this product by Exiao, contact us by completing and submitting the form below. If you are looking for a specif part number, please include it with your message.